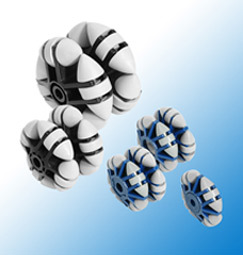 The Ergo Roll multi-directional conveyor rollers are structured around the principle of mounting four free turning barrel shaped rollers in a 90 degree staggered pattern around the perimeter of a main wheel hub. This arrangement provides a total of five rotational axles per each wheel assembly. In a paired or duplex wheel configuration, where two wheels are placed side-by-side, a total of 9 individual rotational turning axles allow for easy multi-directional transfer movement. The roller’s open construction allows particles or dirt in the use application to gravitate through the roller structure, without causing binding or lock-up of the multi-directional roller function. The roller is made out of self-lubricating plastics, and works equally well in wet application and does not require maintenance or lubrication for long service life. The roller design provides a large load-carrying surface and is therefore not likely to indent or scratch the material being transferred on it.